PARVATI was pleased at hearing the revelation of the auspicious Mantra of the Adya Kalika, which yields abundant blessings, is the only means of attaining to a knowledge of the Divine essence, and leads to liberation; as also at hearing of the morning rites, the rules relating to bathing, Sandhya, the purification of Bhang, the methods of external and internal Nyasa and worship, the sacrifice of animals, Homa, the formation of the circle of worship, and the partaking of the holy food. Bowing low with modesty, the Devi questioned Shankara (1-3). O Sadashiva! Lord, and Benefactor of the Universe, Thou hast in Thy mercy spoken of the mode of worship of the supreme Prakriti (4), which benefits all being, is the sole path both for enjoyment and final liberation, and which gives, in this Age, in particular, immediate success (5). My mind, immersed in the ocean of the nectar of Thy word, has no desire to rise therefrom, but craves for more and more (6). O Deva, in the directions Thou hast given relating to the worship of the great Devi, Thou hast but given a glimpse of the hymn of praise, and of the protective Mantra. Do Thou reveal them now (7). Listen, then, O Devi, Who art the adored of the worlds,to this unsurpassed hymn, by the reciting of or listening to which one becomes the Lord of all the Siddhis (8), (a hymn) which allays evil fortune, increases happiness and prosperity, destroys untimely death, and removes all calamities (9), and is the cause of the happy approach to the gracious Adya Kalika. It is by the grace of this hymn,O Happy One, that I am Tripurari (10). O Devi! the Rishi of this hymn is Sadashiva, its metre is Anushtup, its Devata is the Adya Kalika, and the object of its use is the attainment of Dharmma, Artha, Kama, and Moksha (11). O Thou Who by the three Vijas, Kring, Hring, Shring, art the Destructress of the fear of Death. These are proclaimed as the Hundred Names of Kalika (32), beginning with the letter Ka. They are all identical with the image of Kali (33). He who in worship recites these names with his mind fixed on Kalika, for him Mantra-siddhi is quickly obtained, and with him Kali is pleased (34). By the mere bidding of his Guru he acquires intelligence, knowledge, and becomes wealthy, famous, munificent, and compassionate (35). Such an one enjoys life happily in this world with his children and grandchildren with wealth and dominion (36). He who, on a new moon night, when it falls on Tuesday, worships the great Adya Kali, Mistress of the three worlds, with the five Ma-karas, and repeats Her hundred names, becomes suffused with the presence of the Devi, and for him there remains nothing in the three worlds which is beyond his powers (37-38). He becomes in learning like Brihaspati himself, in wealth like Kuvera. His profundity is that of the ocean, and his strength that of the wind (39). He shines with the blinding brilliance of the Sun, yet pleases with the soft glamour of the Moon. In beauty he becomes like the God of Love, and reaches the hearts of women (40). He comes forth as conqueror everywhere by the grace of this hymn of praise. Singing this hymn, he attains all his desires (41). All these desires he shall attain by the grace of the gracious Adya, whether in battle, in seeking the favour of Kings, in wagers, or in disputes, and when his life be in danger (42), at the hands of robbers, amidst burning villages, lions, or tigers (43), in forests and lonely deserts, when imprisoned, threatened by Kings or adverse planets, in burning fever, in long sickness, when attacked by fearful disease (44), in the sickness of children caused by the influence of adverse planets, or when tormented by evil dreams, when fallen in boundless waters, and when he be in some storm-tossed ship (45). O Devi! he who with firm devotion meditates upon the Parama Maya image of the most excellent Kali is without a doubt relieved of all dangers. For him there is never any fear, whether arising from sin or disease (46-47). For him there is ever victory, and defeat never. At the mere sight of him all dangers flee (48). He expounds all Scriptures, enjoys all good fortune, and becomes the leader in all matters of caste and duty,and the lord among his kinsmen (49). In his mouth Vani ever abides, and in his home Kamala. Men bow with respect at the mere mention of his name (50). The eight Siddhis, such as Anima and others, he looks upon as but mere bits of grass. I have now recited the hymn of a hundred names, which is called "The Very Form of the Adya Kali" (51). Purashcharana of this hymn, which is its repetition one hundred and eight times, yields all desired fruit (52). This hymn of praise of a hundred names, which is the Primeval Kali Herself, if read, or caused to be read, if heard, or caused to be heard, frees from all sins and leads to union with Brahman (53-54). I have spoken of the great hymn of the Prakriti of the Supreme Brahman, hear now the protective Mantra of the sacred Adya Kalika (55). The name of the Mantra is "Conqueror of the three Worlds," its Rishi is Shiva, the verse is Anushtup, and its Devata the Adya Kali (56). 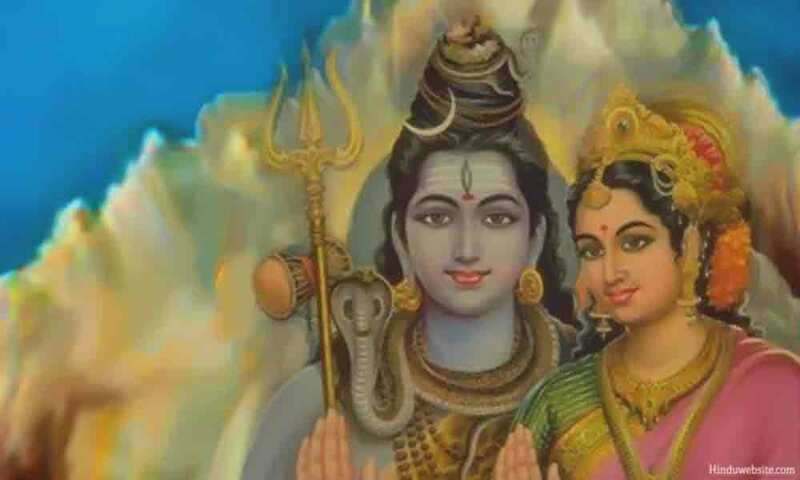 Its Vija is the Maya Vija, its Shakti is Kama Vija, and its Kilaka is Kring. It should be used for the attainment of all desired objects (57). And Sarvva-siddhi-da protect all parts of my body (63). As to those parts as have not been mentioned in the Kavacha, and are unprotected, may the Eternal Primeval Kali protect all such (64). I have now spoken to Thee of the wonderful heavenly Protective Mantra of the Adya Devi Kalika, which is known as the "Conqueror of the three Worlds" (65). He who repeats it at his devotions with his mind fixed upon the Adya obtains all his desires, and She becomes propitious unto him (66). He quickly attains Mantra-siddhi. The lesser siddhis become, as it were, his slaves (67). He who is childless gets a son, he who desires wealth gains riches. The seeker of learning attains it, and whatsoever a man desires he attains the same (68). The Purashcharana of this Protective Mantra is its repetition a thousand times, and this gives the desired fruit (69). If it be written on birch-bark, with the paste of sandal, fragrant aloe, musk, saffron, or red sandal, and encased in a golden ball, worn either on the right arm, round the neck, in the crown lock, or round the waist, then the Adya Kali becomes devoted to its wearer, and grants him whatsoever he may desire (70-71). Nowhere has he fear. In all places he is a conqueror. He becomes ready of speech, free from ailments, long-lived and strong, endowed with all power of endurance (72), and an adept in all learning. He knows the meaning of all Scriptures, has Kings under his control, and holds both pleasure and emancipation in the hollow of his hand (73). For men affected with the taint of the Kali Age it is a most excellent Mantra for the attainment of final liberation (74). Thou hast, O Lord! in Thy kindness told me of the Hymn and Protective Mantra; I now desire to hear of the rules relating to Purashcharana (75). The rules relating to Purashcharana in the worship of the Adya Kalika are the same as those relating to the Purashcharana in the worship with the Brahma-Mantra (76). For Sadhakas who are unable to do them completely, both Japa, Puja and Homa, and Purashcharana may be curtailed (77), since it is better to observe these rites on a small scale than not to observe them at all. Now listen, O Gentle One! the while I describe to Thee the shortened form of worship (78). Let the wise one rinse his mouth with the Mula-Mantra, and then perform Rishi-nyasa. Let him purify the palms of the hands, and proceed to Kara-nyasa and Anga-nyasa (79). Passing the hands all over the body, let him practise Pranayama, and then meditate, worship, and inwardly recite. This is the ceremonial for the shortened form of worship (80). In this form of worship, in lieu of Homa and other rites, the Mantras may be recited four times the number prescribed in the case of each of them respectively (81). There is also another mode of performance. A person who, when the fourteenth day of the dark half of the month falls on a Tuesday or Saturday, worships Jaganmayi with the five elements of worship, and recites with fully attentive mind the Mantra ten thousand times at midnight and feasts believers in the Brahman has performed Purashcharana (82-83). From one Tuesday to another Tuesday the Mantra should every day be inwardly recited a thousand times. The Mantra thus recited eight thousand times is equal to the performance of Purashcharana (84-85). The carrying out of the practices ordained produces purification of the heart. The Mantra should, however, first be received from the mouth of the Guru in the case of the Brahma-Mantra (93). O Great Queen! Purashkriya should be done after the performance of the necessary worship and of other prescribed rites. In the purified heart knowledge of Brahman grows. And when knowledge of Brahman is attained, there is neither that which should, nor that which should not, be done (94). O Great Deva! what is Kula, and what is Kulachara? O Great Lord! what is the sign of each of the five elements of worship? I desire to hear the truth relating to these (95). The characteristic of the first element is that it is the great medicine for humanity, helping it to forget deep sorrows, and is the cause of joy (103). But, O Dearest One! the element which is not purified stupefies and bewilders, breeds disputes and diseases, and should be rejected by the Kaulas (104). Beasts bred in villages, in the air, or forest, which are nourishing, and increase intelligence, energy, and strength, are the second element (105). O Beautiful One! of the animals bred in water, that which is pleasing and of good taste, and increases the generative power of man, is the third element (106). The characteristics of the fourth element are that it is easily obtainable, grown in the earth, and is the root of the life of the three worlds (107). And, O Devi, the signs of the fifth element are that it is the cause of intense pleasure to all living things, is the origin of all creatures, and the root of the world which is without either beginning or end (108). Know, Dearest One! that the first element is fire, the second is air, the third is water, the fourth is the earth (109), and, O Beauteous Face! as to the fifth element, know it to be ether, the support of the Universe (110). O Sovereign Mistress of Kula, he who knows Kula, the five Kula-tattvas, and Kula worship, is liberated whilst yet living (111). End of the Seventh Joyful Message, entitled "Hymn of Praise (Stotra), Amulet (Kavacha), and the description of the Kula-tattva."